Winnipeg, May 23, 2012: Canadians use more water than almost anyone on earth, a whopping 329 litres a day. We use so much water that in the summer, 50 per cent goes on the lawn or the garden. Our attitude towards our most precious resource highlighted a 16-city cross-Canada tour last October and November conducted by Canmore-based Bob Sandford, co-chair of the Forum for Leadership on Water (FLOW) and one of Canada’s foremost water experts. Over a two-month period, Sandford talked to hundreds of Canadians, getting a first-hand account of the state of fresh water across the country – the first time since the 1980s that anyone has taken the national pulse on water. The 42-page report on the tour documents the growing need for solutions that transcend chronic jurisdictional challenges. Sandford will release the report today at noon CDT at the 2012 Living Lakes Canada Gathering held at the Radisson Hotel in downtown Winnipeg at 288 Portage Avenue. The report, Cross-Canada Checkup: A Canadian Perspective on our Water Future, is co-authored by Jesse Baltutis of the University of Victoria’s POLIS Project on Ecological Governance, and Timothy Shah of Simon Fraser University’s Adaptation to Climate Change Team (ACT), with guidance from Sandford. Both POLIS and ACT were partners with FLOW for the tour and the report. The way Canadians use water, it appears we think we have an endless supply, noted Sandford. Yet, as revealed in the national tour conducted last fall, some of us, at least, are growing concerned about water – a concern fuelled by climate change – and an urgent call for a national water strategy is emerging. Everywhere he went, Sandford discovered Canadians face pressing issues driven jointly by climate change and increasing demands on a finite resource. At the same time as he gathered information, Sandford presented a possible model for a national strategy, a new water stewardship plan from the Northwest Territories (NWT) that he had a hand in creating. 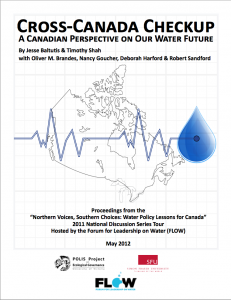 Sandford and FLOW, POLIS and ACT will be presenting Cross-Canada Checkup: A Canadian Perspective on Our Water Future to Ottawa in hopes that it will launch a discussion on a national water strategy at the highest level. Bob Sandford is the EPCOR Chair of the Canadian Partnership Initiative in support of United Nations “Water for Life” Decade an initiative aiming to translate scientific research outcomes into language decision-makers can use to craft timely and meaningful public policy. Bob also sits on the Advisory Committee for the prestigious Rosenberg International Forum on Water Policy where he works to bring broad international examples to bear on Canadian water issues. He sits on the Advisory Board of Living Lakes Canada, the Canadian chapter of Living Lakes International, and is co-chair of the Forum for Leadership on Water (FLOW), a national water policy research group centered in Toronto. He is also a member of the Advisory Panel for the RBC Blue Water Project.